The first season of the American comedy-drama television series Scrubs premiered on NBC on October 2, 2001 and concluded on May 21, 2002 and consists of 24 episodes. 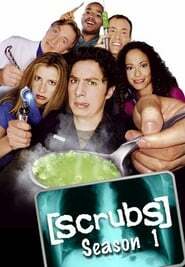 Scrubs was created by Bill Lawrence who wrote the pilot as well as 3 other episodes in the season. Adam Bernstein directed the pilot as well as 4 other episodes. Neil Flynn was only a guest star in the first season, although he appeared in every episode of the season. Bill Lawrence said if the show had been cancelled at the end of the first season, he would have made the Janitor a figment of J.D.’s imagination.